Organic extra virgin olive oil, Beeswax, Organic jojoba oil, Shea butter, Cocoa butter, Delicious love & toast flavor, Organic hemp seed oil, Aloe vera oil, Vitamin E, Stevia. If you have ever tasted vanilla chai tea then Love & Toast have summed it up perfectly in this lip balm. The packaging of these balms is gorgeous with cardboard box outer packaging! When you open the lid you see a small heart shaped cut-out. On the next flap there is a toast shaped hole and then inside nestles a beautifully made glass jar with a metal lid. This is a recently discovered range for both me and my sister and as of now the Love & Toast brand is not easily available. We first found these products in the SpaceNK store in Bath. We have not found them anywhere else but online since. As the products are quite expensive my sister and I decided to spend a set amount each and then swap products so we could try everything we wanted. There are simply too many gorgeous irresistible products in this range so beware! The balm inside has no artificial colours or flavours and is a thick slightly yellow colour. It has ingredients of organic olive oil, Jojoba seed oil, hemp seed oil, shea butter, aloe and Vitamin E. You only need a small amount on your fingertip for an application and the balm melts beautifully into the lips leaving a subtle sheen but no greasy residue at all. The fragrance and flavour of this balm is authentic vanilla chai which is a beautiful blend of vanilla and subtle spices. The balm applies beautifully to the lips and leaves them soft, supple with a delicate sheen. The effects are long lasting without the need for re-application. The pot is big and lasts for such a long time and I am totally addicted to this one! The glass pot is heavyweight so not ideal for portability but it looks gorgeous on your dressing table and very unique and pretty. If you are looking for a cheap balm then this is not for you, but of you love quirky, quality and fun products I cannot recommend this line highly enough. This flavour/ scent is one of my favourites….so yummy! 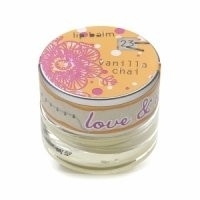 "If you have ever tasted vanilla chai tea then Love & Toast have summed it up perfectly in this lip balm. The packaging of these..."